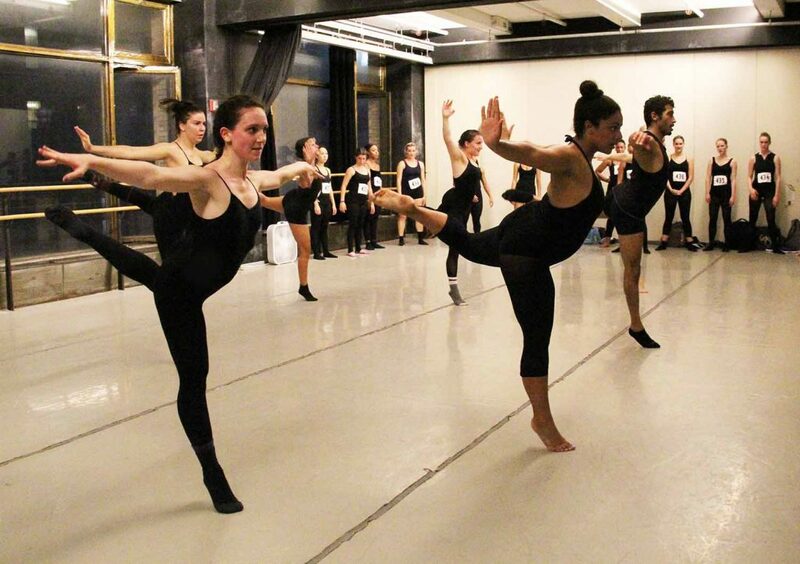 New York Dance Festival Fall Workshops NYC & KDT Auditions 2016! International Producer and American Choreographer Sean McLeod looks on as New York City Professional Dancers dance a combination at the Kaleidoscope Dance Theatre Auditions NYC at Dance Arts New York (DANY) in New York City. Another unique element of McLeod Technique is its “Split Level Teaching”, which is woven seamlessly into all MT Workshops and Master Classes. Split Level Teaching is a process where all ages and abilities work together in the same space and it is up to the master teacher in the space to ensure that everyone walks away deeply fulfilled and mentored in their learning. Whether it be a novice dancer in a master class of professionals or a multi-certified personality being called on to teach instantly, each person has a profound learning opportunity during a McLeod Technique class. One instance of Split Level Teaching happened on Friday as New York Institute of Dance & Education Junior Associate, Kaleidoscope Dance Theatre First Company Member, and McLeod Technique Certified Personality that teaches MT (McLeod Technique) in NYC Joseph Akin, was surprised by being given the floor by founder Sean McLeod to begin this second day of McLeod Technique NYC Workshops. MT Split Level Teaching keeps everyone learning at a very high level and removes the burden off the student to be good enough to be taught by a master teacher, and places that responsibility on the master teacher where it belongs. A huge fear relieving and welcomed realization for all dancers that have encountered the method so far. NYIDE Junior Associate and Kaleidoscope Dance Theatre First Company Member Joseph Akin starts off the New York Dance Festival Fall Workshops NYC Friday night classes with the MT 4 Rules of Interaction at Gibney Dance Union Square (890 Broadway). In every aspect of McLeod Technique there is always something more to learn, whether it be physically, mentally, or emotionally. That is exactly what every dancer attending -company member or not- the Kaleidoscope Dance Theatre Audition on Saturday experienced. You instantly understand for Sean, “dance” is more then just the body; it is about the mind and soul as well. But not just in that clique way that almost everyone says these days. Like, “we are all family, or this is just like family”. It is way more simple yet more profound than that. You learned, just as you would take care of an injury to maintain the health of you dance body, you must more so take care of your emotional self to maintain the health, the mental health this is the foundation of who you are. How you are. One of the most powerful MT lessons taught during a Kaleidoscope Dance Theatre Auditions is that dance doesn’t have to (and shouldn’t) degrade you or anyone around you. You are not competing against the other dancers, you should be bonding with them. An audition is a dreadful solitary event full out angst and loathing other accomplishments. However, according to Sean and McLeod Technique, an audition should be a place of joy, filled with people who know your situation better then most others anywhere and certainly outside that room. An Audition space should be a place of easy connection, rather then competition. Because of the McLeod Technique principles that were laid out so clearly to the auditionees, that is exactly what happened. And it was powerful. 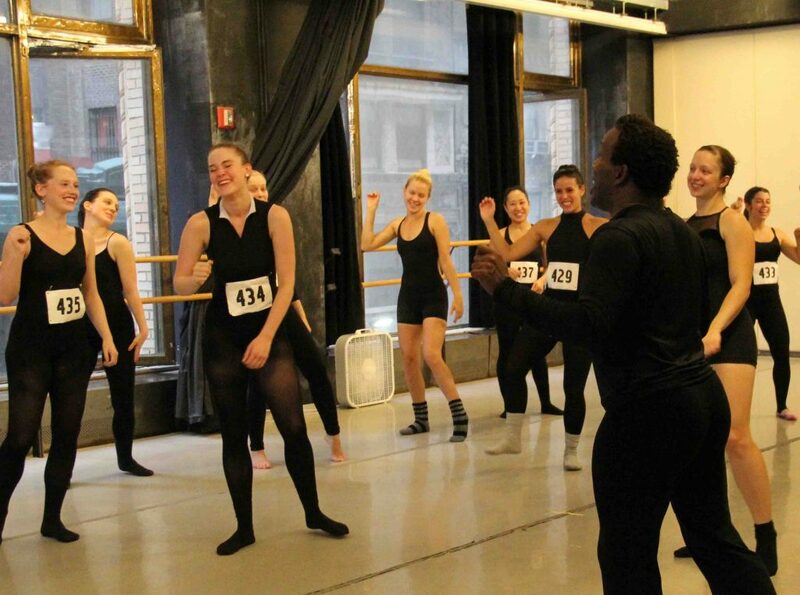 International Producer and American Choreographer Sean McLeod teaches auditionees that “Joy should be the standard” and that dance should not be a place of self-degradation. Kaleidoscope Dance Theatre Rehearsal Director and Soloist Devon McLeod leads a combination at the Kaleidoscope Dance Theatre Auditions alongside KDT First Company Edward Rosado, Company in Training Abby Marchesseault, and Company in Training from Australia Lauren Farrugia. Kaleidoscope Dance Theatre Principal Jerami Kipp and Soloist Kierstyn Zaykoski demonstrate a combination at the Kaleidoscope Dance Theatre Fall Auditions at DANY.